Fear, worry, and anxiety are normal occurrences within the life of a child. Helping children to understand and process these emotions often falls in the hands of parents, who by their own admission often feel painfully concerned, overwhelmed and unprepared to deal with these kinds of feelings. The only prototypes available to most families are those carried forward from generation to generation, with little information regarding the physiological and psychological facts surrounding anxiety, and even less regard for what children are feeling and thinking in the face of these emotions. Stomach aches, increased crying, refusal to go to school, irritability, changes in toileting habits, sleeplessness and nightmares, tics, eating too little or too much, increased need to sleep with parents, inattentiveness in school, preoccupation with negative thoughts, insatiable needs for reassurance, clinginess, increased startle responses, separation issues, self imposed isolation, repetitive behaviors and sadness can all be indicators of anxiety and worry in a child. How hard is it for a parent to remain calm and understanding in the face of their own child’s fears, especially if they are unprepared and unsure of what to say? Becoming alarmed in the face of these behaviors and changes can only exacerbate the situation, and will certainly not do much to calm a child’s fears. In this book, Dr. Laurie Zelinger and our son, Jordan make every effort to provide families with a description of anxiety that children can understand, and suggestions that parents can use when addressing their child’s concerns. Using common, everyday language, concepts describing the physiological basis of anxiety are clearly presented in understandable and “user” friendly terms. Parents and children will be enthralled with the “world of dinosaurs” used to depict the physical origins and psychological impact of anxiety. Children will be left with an understanding of “anxiety” consistent with their various developmental levels and parents will have the tools they need to discuss and explain anxiety issues to their children. Reading and re-reading this book with children will demystify anxiety, and provide families with the understanding needed to manage these uncomfortable emotions. Parents must become aware of the difference between typical feelings of anxiety, and those that represent a more serious “mental health “concern. The simplest rules of thumb are based on frequency, impact upon regular life functions, persistence, and a pervasive sense of either hopelessness or worry. Many issues and transitions in the life a child are expected to cause temporary anxiety. When a developmentally common worry appears to get out of hand however, or stressors remain chronic, then contact with a licensed mental health professional is by all means indicated. Your pediatrician, the American Psychological Association or the Association for Play Therapy are among the resources that can help you find family support in your area. Now available in Audio Book format. If my parents had introduced me to the concepts in this book as a child, I would have had a much clearer understanding of why my mind instantly manufacturers doomsday scenarios at the hint of any change in my routine. Also, my parents would have been able to teach me how to cope more productively with this kind of mind. On the other hand, if this had been clarified, I might not have grown up to be the award-winning humorist, former sitcom writer and Psychology Today blogger that I now am. Whichever child-rearing route you choose, I believe this book would be a valuable resource. Excellent resource for kids and parents on the biology of anxiety written in kid friendly manner. Kids with anxiety will do well to read and reread it. Older kids can research more details on concepts introduced in this book such as the sympathetic nervous system and the amygdala. 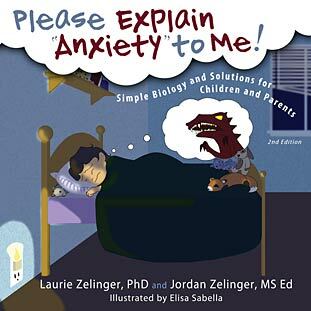 Please Explain “Anxiety” to Me: Simple Biology and Solutions for Children and Parents by Laurie Zelinger, PhD & Jordan Zelinger; illustrated by Elisa Sabella; published by Loving Healing Press, Ann Arbor, MI; 2010. Dinosaurs reacted to their environment with anxiety. It was a way to alert them that they needed to fight or run away from danger. Today, we have the same reaction to stress but most of the time we aren’t in peril like the dinosaurs were. So how do we deal with those feelings when there isn’t a real emergency? According to the authors, “you can train your brain!” Simple rhymes are offered to help remember how to calm down. Dinosaurs have universal appeal to children. By choosing dinosaurs to explain anxiety, the authors have hooked their readers on page one. Further discussion of the biology and psychology of anxiety is explained in terms accessible to even preschool children without condescending. As the story concludes, four rhymes are presented to help remind an anxious mind to calm down. The authors also recommend that children re-read the book to determine which ideas will work best for each individual. In fact, Dr. Zelinger offers a letter of personal experience at the beginning of the book to let children know that she has felt the same things they have felt. In conclusion, a note to parents offers further resources to help children overcome struggles with anxiety issues. Sabella’s illustrations are gentle yet accurately portray the emotions expressed in the text. The use of an on-off switch to depict the sympathetic nervous system is carried throughout the book — from the dinosaurs to the child who is working on the rhymes to train his or her brain. What a terrific visual for children who may not grasp the concept of changing thought patterns! Sign into Goodreads to see if any of your friends have read Please Explain Anxiety to Me! Simple Biology and Solutions for Children and Parents. I was eager to get this book for review and happy that I did. 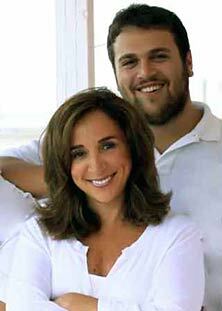 Dr. Laurie Zelinger and son Jordan Zelinger have managed to explain the biological reasons for anxiety in such a simple way that my young children easily understood it. My 6-year-old son and even my daughter loved the use of dinosaurs in the explanation, and I thought the comparison to a switch turning on and off was brilliant. The illustrations are also simple, colourful and age-appropriate. This is a comforting book, both for children and parents. The therapeutic strategies outlined are uncomplicated and effective, and at the end of the book are summarized in the form of rhymes to make them easy to remember. My children quickly associated with some of the situations that can cause anxiety. It made them realize that they are not the only ones to feel that way at times. Throughout the days after I read them this book, my children on different occasions have said to me, “Mom, my switch is on.” I quickly understood what they meant and was happy they recognized how they were feeling. I asked them if they remembered what they could do to alleviate the feeling of anxiety and they did and put some of those solutions to practice. Best of all, this is an empowering book. Every parent should read it. It is an essential tool to explain what anxiety is to children but most importantly how to deal with it. And in a society where the medical community tends to overmedicate patients, including children, I cannot stress how good it is to read a book to my children that shows them how they can control how they feel. Kudos to the Zelingers! “Please Explain ‘Anxiety’ to Me” by Laurie Zelinger, PhD, and her son Jordan Zelinger is a children’s book designed to help explain anxiety, or unnecessary worry, to children. Many children experience physical symptoms when they worry, and this book explains the physical reactions of the body during anxious moments. Beginning with a story about the dinosaurs and how plant-eating dinosaurs worry about being eaten, the authors make parallel connections between the sympathetic nervous system of the dinosaur and that of humans. Explained in simple terms, there is an “on-off” switch within each of us that sometimes flips to “on” when we worry unnecessarily. Tips for children to shut off this switch end the book. Children are taught easy to remember tips such as “Blow slow” to remind them to breathe slowly when anxious or to “Talk or walk” to remind them to talk to a trusted adult or to change locations. The book is also full of nice, colorful pictures to hold the interest of a child. On a personal note, I have an anxious grade school child. I read this book to him. First I asked him, “Do you ever worry about things you know you shouldn’t?” He said, “Oh, yes!” Right away, he related to the premise. As a worried parent I learned not only how to teach my child how to deal with unwarranted worries, but also how to implement some of the tricks to retrain myself. I will be passing this book on to our school’s psychologist. I highly recommend “Please Explain Anxiety to Me.” To realize my child is not alone in his worries and to appreciate there are ways to help him is a huge relief. Please Explain “Anxiety” to Me! is co-written by the Feelings Doctor aka psychologist Dr. Laurie Zelinger who herself had gone through an anxiety phase when she was a kid. The book explains anxiety to the reader by using the characters of dinosaurs and then moves on to compare them to human reactions. The story, written in an easy to understand and simple language will benefit young children who are trying to have a better grasp of the biological reasons behind anxiety. I like that the author actually pointed out that anxiety is not ALL BAD. It’s when there is too much anxiety that causes some upsetting responses. As a parent, I learned something new in the book too! Did you know that we have a “sympathetic nervous system” ? It’s like a switch in our body which gets turned on when we feel that we are in danger. This “switch” is NOT supposed to be on all the time. To counter this reaction, the authors have recommended some simple activities to relax the mind and body such as breathing more slowly, blowing a giant soap bubble, doing jumping jacks, playing jump rope or even daydreaming something fun. You can find four fun rhymes at the end of the book which will help children remember these therapeutic techniques. I like that Please Explain “Anxiety” To Me! covers the “why” and “how to” of anxiety in a kid friendly manner. Knowing what causes anxiety in children is not enough as it is equally important that the child suffering from it, understands this as well. Just as important is the fact that as parents, we know HOW TO teach our children to deal with anxiety. There is also a special page on “Notes To Parents” which I find pretty informative. Overall, Please Explain “Anxiety” To Me! is a good book with beautiful and colourful illustrations which will serve as a useful tool for parents to help TURN OFF the anxiety switch of children who are suffering from it. You can get your copy from Amazon. Please Explain “Anxiety” to Me! 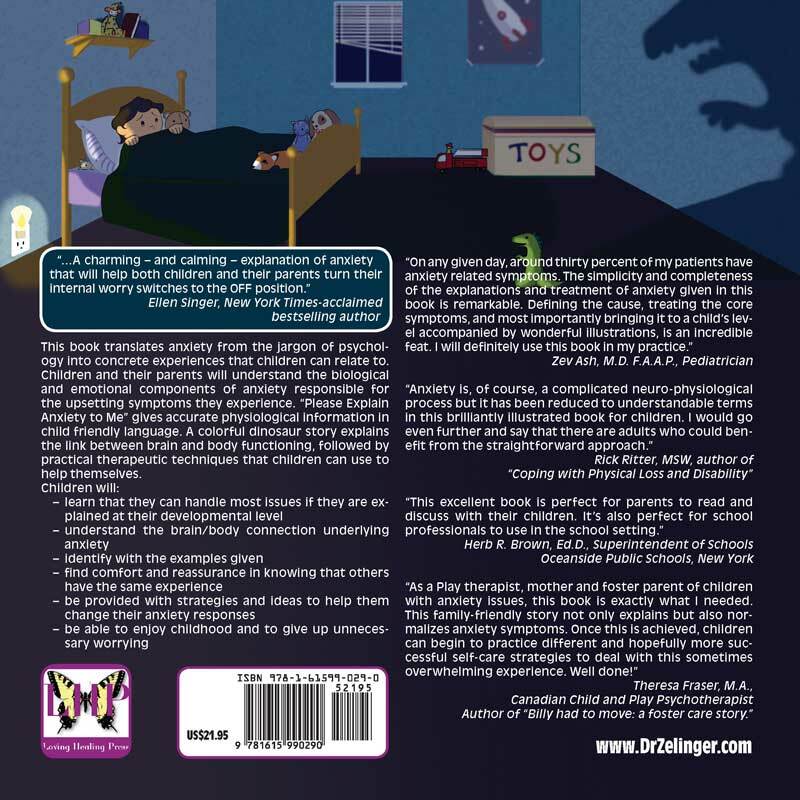 by Laurie Zelinger, PhD & Jordan Zelinger is an early reader for children explaining simple biology and solutions pertaining to anxiety. The book starts out with dinosaurs roaming the earth. There were many hardships to overcome to survive if you are a dinosaur. Things like the environment, food and predators can make a dinosaur worry. Over time the dinosaur develop their “instincts” and their reactions to certain situations. One of the reactions being discussed is anxiety. The book describes how our Amygdala (a mig’ da la), registers and remembers how we react in certain situations and later, when we need that specific feeling, the Amygdala brings it back up again and has us react as we do. Sometimes our body tricks us and makes us think we are nervous, anxious or worried, when we’re really not. There is a “switch” inside each of us being controlled by the Amygdala which determines how we react. When quick energy is needed for us to respond, this triggers our “Sympathetic Nervous System”, which fuels us into action, sometimes having us do feats we would be unable to do otherwise. The book suggests that we become friends with our inner psyche, reassure it when it gets overactive, remind it that you have been in this situation before and you will respond appropriately. It also reminds you that you can talk to your parents, teacher, pastor, psychiatrist etc. to get the help you need to aid your anxiety fears. You can train your brain to react differently with simple techniques to help encourage it to respond with less indifference instead of over-reaction. I thought this book was a good early primer for your fussy/anxious child. The simple story is enough for young children to grasp its meaning and perhaps get something from its message. I liked how dinosaurs were introduced and all the problems that occurred to them in their every day lives. I thought that the explanations for the anxiety was explained easily so that your young person can follow and understand. I didn’t think the graphics in the book were spectacular, they were simple enough in their depiction but lacked any “oomph” in their overall appearance, as well, the cover is nondescript and not very “eye-catching”. I did like how they technical lingo of the psychology of the situation was explained well and simply. I enjoyed the biology of the book via the explanation on how the amygdala and the body work together. I didn’t know that the amygdala stored so much information for later use, that was interesting to read. I thought the reinforcement that comfort can be found in the fact that no one is alone in their thoughts and feelings and many of us have the same reactions, reminding children to be children and allowing the adults to look after their needs. Overall, this would be a fairly decent book to help your young person understand their feelings, but I just thought there would have been more for the reader. But as a 101 primer for the young, this book would be most excellent. Keeping copies of this in centers for children with psychological difficulties or in doctors offices would be beneficial. 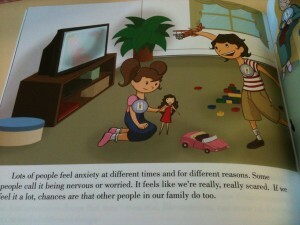 Please Explain Anxiety to Me is a book written by Laurie Zelinger, PhD and her son Jordan Zelinger and, illustrated by Elisa Sabella which is designed to help explain anxiety, or unnecessary worry, to children. Many children including mine, experience some forms of anxiety, especially when they are in the unknown or after going through a difficult time. Their little bodies will show some physical symptoms when they worry, and this book helps to explain the physical reactions of the body during those anxious moments. Dr Zelinger, who used to worry a lot when she was a kid, connects readers by using the story of dinosaurs and how their reactions are similar to humans when they experienced anxiety. The book begins by talking about the plant eating dinosaurs which are often afraid of the meat eating dinosaurs since the meat eating dinosaurs can only eat… well, dinosaur meat! As such, the smaller plant eating dinosaurs are often afraid of the bigger meat eating dinosaurs. This causes the plant eating or smaller dinosaurs to worry about the dangers around them all the time. The author has cleverly used the concept of the ‘switch’ which she called it the ‘Sympathetic Nervous System’ to explain how we can turn on and off our nervous system when we are faced with ‘danger’. At this point, our body will do different activities which relieved us from feeling scare or worried and calmed us down so we could think of a way to overcome our difficult situation. Beside the simple explanation, this book is also full of nice, colorful pictures to hold the interest of a child. I have the pleasure of reading this book with my 5 years old boy and he asked me a lot of questions when he arrived on the page where there was a boy sleeping in the dark and there was a shadow of a monster on the wall. So, I spoke to him about his favorite cartoon, the monsters in Monsters Inc. and how the little girl, ‘Boo’ was afraid off the monster which came for her from her closet every night. Then I told him that our minds are very good at imagining things which are often unreal but causes us much anxiety and made us scare and worry all the time. From this book, we learned that anxiety is not all bad or yucky. It is actually a reaction when our body is feeling uncomfortable if faced with something we are not warranted for. This book provides us with different activities that we could do such as ‘breathe more slowly through our nose and blow out very slowly from our mouth’, ‘blowing a giant soap bubble’, ‘do some jumping jacks’ or do something which will distract our mind from thinking of the bad things. Even daydreaming is a good way to counter anxiety!! I highly recommend this book if you have a fidgety child at home. My son gets worried all the time and I using all the information in this book to help him feeling less nervous especially when we will be moving to another country soon where everything will be so different. I can anticipate the culture shock in him and thus, I need to learn as much as I can in dealing with anxiety. Disclosure: I have received the above book to facilitate my review from Parent Reviewers and I was not compensated in any other forms for this post. All opinions expressed are entirely my own.